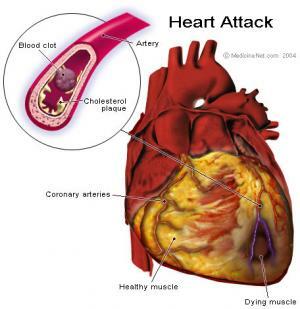 Acute myocardial infarction is the extinction of the heart muscle due to sudden cessation of the circulation through one of the arteries that feed the heart. Presence of cardiovascular risk factors is more likely develop myocardial infarction or other forms of coronary disease. The most important cardiovascular risk factors include genetic predisposition, age, male gender, diabetes, high blood pressure, smoking, high level of various types of fat in the blood, obesity, physical inactivity and so on. Acute myocardial infarction is accompanied by various symptoms. However, the main symptom is pain. The pain mostly occurs in the morning, after physical activity, abundant meal, or when it's cold. Pain is located behind the breastbone; it is very strong and describes as squeezing, burning or even tearing in the chest. The pain lasts over half an hour and usually is stronger and longer than any of the previous attacks if the patient has had previous attacks of pain in the chest. The pain usually spread through left shoulder, left arm or the lower jaw. It may be accompanied by profuse sweating and weakness occurred rapidly, and lack of oxygen and very often a strong fear of death. However, pain as a symptom can be absent (especially in patients with diabetes) and then the other following symptoms may indicate on myocardial infarction. Congestive heart damage and shock in myocardial infarction may develop as insidious or sudden with arrhythmia or pulmonary embolism. Sedatives and weakness often mask dyspnea and ortopnea. Vein distension in the neck, gallop rhythm, mitral insufficiency noise, abnormal heart pulsations, painfully sensitive and enlarged liver and sacral edema should be treated every day. If patient don’t take anticoagulants, in 10-20% of cases it leads to pulmonary embolism. This is characteristic of acute and convalescent state. Arrhythmia occurs after myocardial infarction and it is considered to be the cause of death in about 40% of patients. The mechanism consists of delay or fibrillation of the heart chambers, which occur after a shock or damage to the heart. Constant monitoring revealed the presence of ventricular tachycardia, complete A-V block and other less serious arrhythmias. It is important to recognize arrhythmias on time to start with treatment. Cerebrovascular changes may occur as a consequence of fall in blood pressure due to myocardial infarction or embolism occurred because of mural thrombus. Myocardial infarction occurs again in 5% of patients or it is expressed as continued state of myocardial infarction including everything from the start of first attack. Rupture of the heart is not common. If there it is, rupture typically occurs in the first week. Interventricular septum perforation is very rare. It is characterized with sudden appearance of loud and rugged systolic noise over the lower left parasternal region. Early after convalescent state appear ventricular aneurysm and peripheral arterial embolisms Approximately 20% of patients develop some sort of aneurysm or akinesia of the left ventricle, which is clinically recognized by abnormal paradoxical precordial pulsations. Some of these patients come into a state of refractory heart damage and the only help is the surgical intervention. Shoulder-hand syndrome occurs after prolonged immobilization of arm and shoulder due to the reflex dystrophy of sympathetic. Early pain over the injured shoulder is accompanied by hand pain, swelling and hand weakness and excessive or reduced sweating. If the condition of shock still persists, there is oliguria, anuria and tubular necrosis.